By installing the EconoHome heat guard the exterior casing temperature will reduce to about 120 F and you will double the heat circulation due to the dual convection heat waves. Safe for pets, babies, and children as it feels warm but doesn't feel very hot on the exterior surface which is similar to ceramic space heaters. Easy setup, just affix the casing by the 4 corner screws for best protection. Our EconoHome Heat Guard can be painted with no-odor water-based paint of any color to match or enhance the décor of any room. 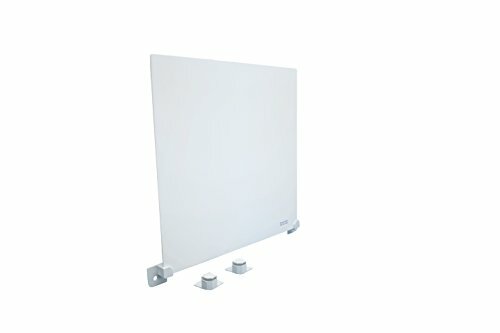 1 Heat Guard that's compatible to the EconoHome wall space heater. REDUCES SURFACE TEMPERATURE: EconoHome heat guard is an optional heater cover that attaches on the wall heater and reduces the temperature of the exterior casing to about 120 F, making it the safest heat of its version! DOUBLES THE HEAT CIRCULATION: Double the proficiency of the heat circulation with the EconoHome heat guard due to the dual convection heat waves. SAFEST FOR PETS, BABIES & KIDS: Worry-free protection for pets, babies and kids. Works most similar to ceramic space heaters that feel warm on the exterior surface while heating up the room. EASY TO INSTALL: This heating guard is very easy to install, just affix on the 4 corner screws for your best protection. PAINTABLE VERSION: Same as the actual heating panel, this heating guard is made out of paintable material so you can match any room décor. Feel free to attach any wall decals or logo stickers. If you have any questions about this product by EconoHome, contact us by completing and submitting the form below. If you are looking for a specif part number, please include it with your message.